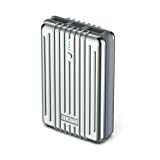 Zendure: Originated from one of the most successful external battery projects on Kickstarter. Trusted by hundreds of thousands of fans worldwide. Join the Zendure experience today. Durability & Style: Crush proof composite material, dual-injection molding and a shock-absorbing central belt make it one of the most durable and yet stylish external batteries available. In addition, the portable charger can maintain up to 95% of charge after six months in standby (when USB disconnected). A great feature for emergency backup. ZEN+: Ultimate compatibility. The USB Ports automatically detects your device and fine tunes the output to charge it at maximum speed (up to 2.1A). The power bank will turn itself on automatically when connected to compatible devices so you don’t need to push the power button on the external battery. Enjoy top charging speed with a “Zen” peace of mind. What’s included: Zendure Portable Charger External Battery Power Bank, Micro USB cable, travel pouch, thank you card, product guide, 18-month warranty and friendly customer service. Does not include an Apple Lightning Cable. • It can survive being run over by a sedan. Yes, we mean it. • Zendure strikes the perfect balance between durability and style. Each port automatically detects your device and fine tunes the output to charge it at maximum speed (up to 2.1A). Enjoy top charging speed with a “Zen” peace of mind. A3 is one of the most compact and lightweight external batteries in the market for its capacity, thanks to the use of top quality components. With 10,000 mAh capacity, this little thing can easily extend your phone usage 3-4 times. • The unique charge-through function allows you to charge the external battery while it is charging your devices, a feature rarely seen in external batteries. • The A-Series battery will automatically turn itself on when connected to a compatible device for charging, then switch back to standby when charging is complete. • The A-Series battery can maintain up to 95% of its charge after six months without use. • The Zendure A-Series is compatible with almost all Apple and Android smartphones, tablets and other USB-charged devices. However, the iPod nano, Asus tablets, the LG G2 and some GPS and Bluetooth devices are not supported. • Use your device’s original cable or our included cable to charge your devices. • Disconnect all cables from the Zendure battery if you don’t intend to use it for a long period of time. This entry was posted in Mobile Deals and tagged –, 10000mAh, 20142017, Advisor, Android, Bank, Battery, Charger, ​External, iPad, More, phone, Portable, Power, Silver, Ultradurable, Winner, Zendure by Cheap Monthly Mobile Phones. Bookmark the permalink.